Born in the 28th of September 1962 in Athens, Greece. 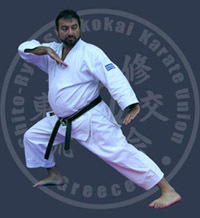 During the year of 1975, in the age of 13, Mr. Karaiskakis started his training in martial arts, under the supervision of Mr. Vasilios ZACHOPOULOS, in a modern Karate system, where most of its techniques originated from Ju Jutsu. With this organisation, Mr. Karaiskakis had many participations and distinctions in Greece, as well as abroad. As Mr. Karaiskakis was growing up, he was seeking for a system more traditional, because he realised that through his occupation with a traditional system he would discover the roots, the philosophy, the values and the beauty of martial arts. For the first time, during the year of 1990, Mr. Karaiskakis was given the chance to gain a closer contact with the four traditional styles, namely Shotokan, Wado Ryu, Goju Ryu and Shito Ryu. In 1991, he decided to train close to Mr Georgios TSOGKAS in Shito Ryu, firstly because Mr. Tsogkas faced Mr. Karaiskakis more positively as a person and secondly, because Shito-Ryu Karate Do teaches all three styles Shuri Te, Naha Te, Tomari Te and he would have a broader viewpoint and knowledge for traditional Karate.